Garlic Chilaca Pickles! Pregnancy Craving Overload! Jar your own! HomePunky HomesteadKitchen of ChaosVegetarian & VeganGarlic Chilaca Pickles – Jar your own! My husband came home from work last week with a bag full of odd looking vegetables. 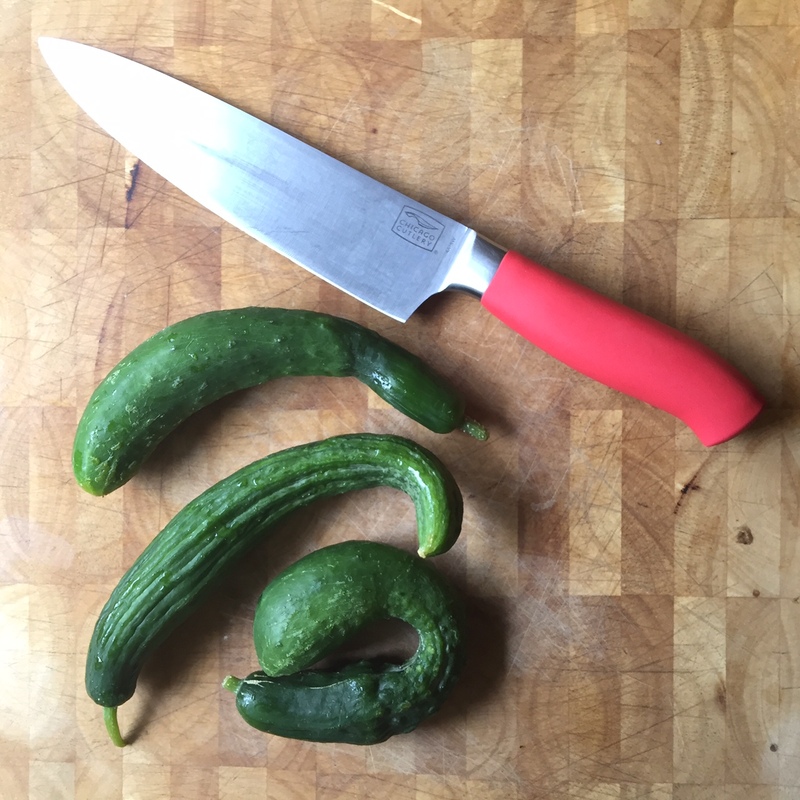 Turns out that a bundle of them were cucumbers and the perfect size for pickling! Now I have never pickled before but I have jarred so I thought it wouldn’t be all that different. I even went a step further and made my own pickles. I made Garlic Chilaca Pickles! I looked to see what else I had on hand that I could use to make pickles. I found some Chilaca peppers, garlic, apple cider vinegar, sugar and salt and decided to give it a whirl! The Chilaca pepper (a.k.a. Pasilla) is a Mexican variety that matures from dark green to dark chocolate brown. It’s a versatile pepper that’s good for sauces, roasting, and grilling when fresh. Chilacas are medium hot but “not so much that they are scary.” Dried they are called pasillas and are common in mole recipes; pasillas (also known as chiles negros) are available both whole and powdered. 1. Slice the cucumbers into the size pickles you prefer. 2. Slice the garlic cloves and peppers into thin slices. 3. Pour the apple cider vinegar, 3 cups water, salt and sugar into a pot and heat just to boiling. Remove from burner. 4. Using a potholder or towel, take the jars out of the warm bath water, making sure you pour any out that may have gotten in. 5. Fill the jars evenly with the cucumbers, garlic slices and peppers. 6. Pour the hot cider mix into each jar, filling to 1/2 an inch below the top, (add additional water if needed). 7. Tightly screw on the lids and let sit on the counter overnight. As they cool the lids should seal. You can use any type of pepper or spices you desire. These pickles are like the perfect pregnancy craving food don’t you think? If you like this recipe, be sure to check out our other super easy meatless monday features!